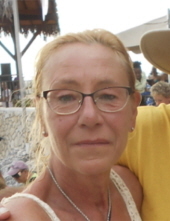 Valerie Cassell Cliber, 62, of New Cumberland died Thursday, January 31, 2019 at Penn State Hershey Medical Center. Val was a devoted mother, wife, and friend. She was a graduate of Cedar Cliff High School and Millersville University where she received a degree in education. Val worked at Sweet Jubilee in Mechanicsburg with a wonderful crew of "work peeps" that she talked about lovingly all the time. Her husband and sons were always her number one priority in life, followed closely by her passion for cooking. She also had a love to travel with her husband David and had a chance to see beautiful places such as Italy, France, Germany and the Caribbean. She had a knack for making new "best friends" everywhere she went. She was the most generous person, giving everything and expecting nothing in return. She was born March 13, 1956 in Harrisburg to the late Donald E. Cassell and Gwendolyn (Weigel) Connolly. She was preceded in death by a brother Kenneth. She is survived by her husband David Paul Cliber; son, Matthew Lair of Phoenixville; two step-sons, David W. and Troy W. Cliber of New Cumberland; and brother, Christopher Cassell of Duncannon. Visitation will be at 4pm followed by memorial services at 5:30pm Wednesday at Parthemore Funeral Home, New Cumberland. To send flowers or a remembrance gift to the family of Valerie Cassell Cliber, please visit our Tribute Store. "Email Address" would like to share the life celebration of Valerie Cassell Cliber. Click on the "link" to go to share a favorite memory or leave a condolence message for the family.